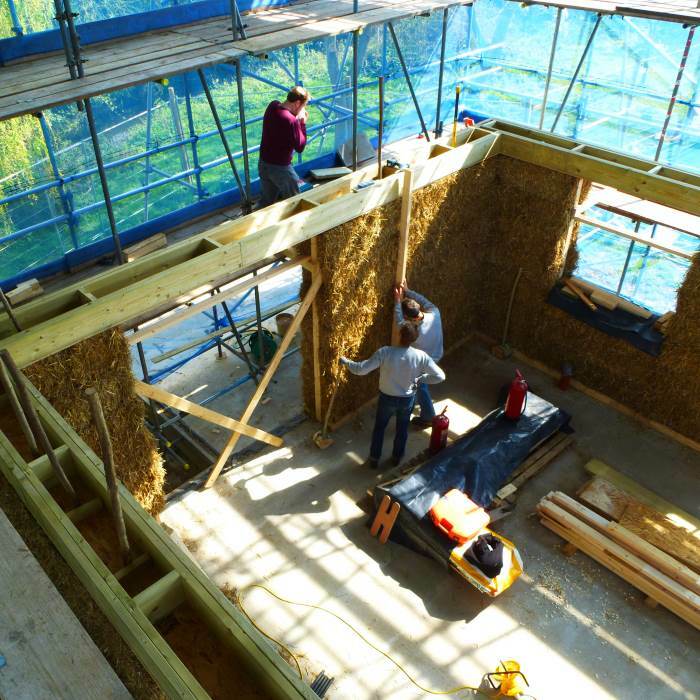 Architect Andrew Goodman explains what it took to create the UK's first load-bearing straw bale Passivhaus home. 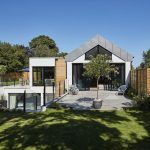 Andrew Goodman is an architect with over 20 years experience running his own practice, currently as a sole practitioner based in Hertford. 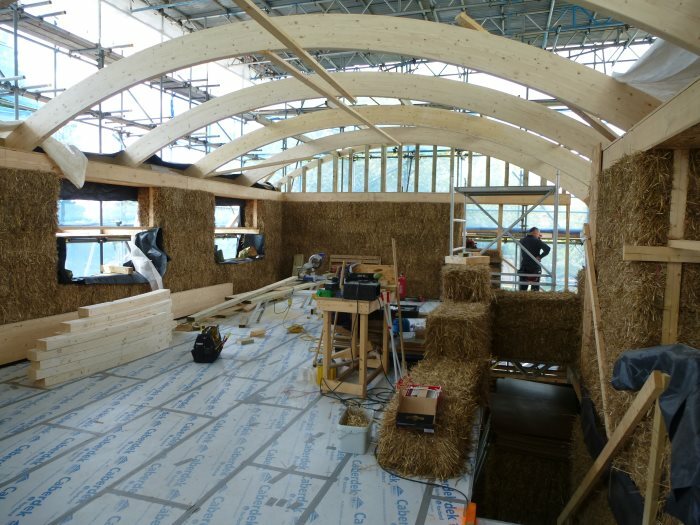 One of his recent projects has been for Dave and Mabel Howorth, who were looking to build a straw bale home for their retirement, with the added challenge of wanting to achieve the Passivhaus standard. 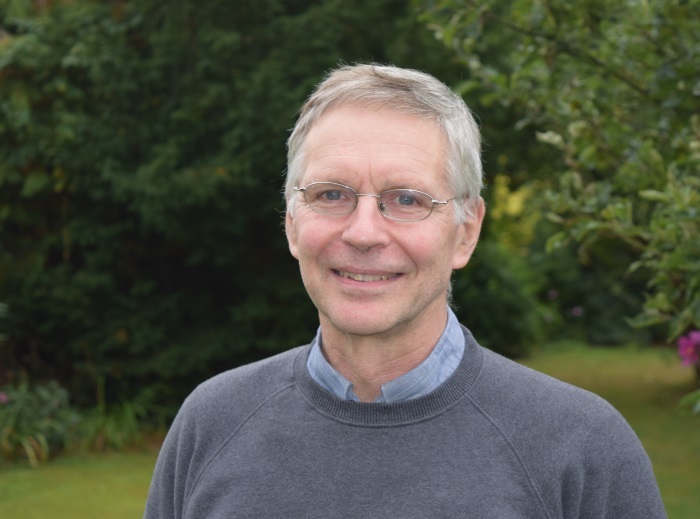 Dave Howorth already had an interest in straw bale buildings and had previously participated on one of Straw Works‘ projects. He was convinced that it was a good way to build and was also attracted by the affordability it provided. It took several years for Dave to find his plot of land. 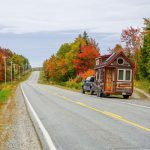 When he bought it, it already had planning permission for a chalet style bungalow, which wasn't ever going to lend itself to either being built with straw bales or to the Passivhaus standard. 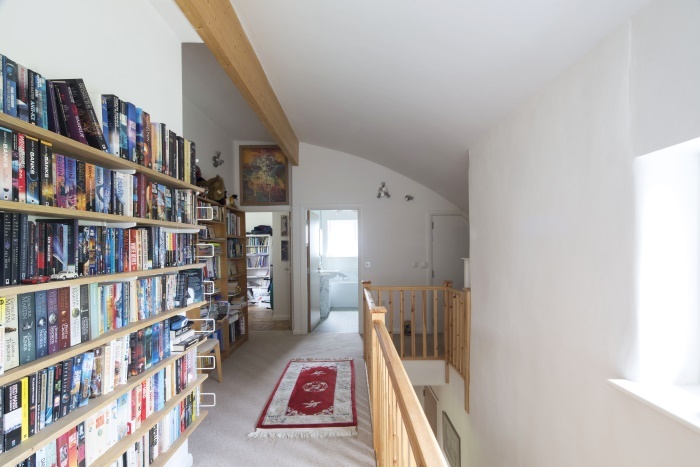 The plot was in the curtilage of an old, listed dwelling with thatched roof and lime plastered walls, and the local vernacular for Dutch barn style curved roofs also gave the extra ceiling height they were looking for, so these both provided a starting point for evolving the design. Being a detached dwelling in an established orchard meant the trees would have some impact on shading the building in a positive way. It was important to Dave and Mabel that the building should meet the Lifetime Home standard, which was about at that time (but since been partially absorbed into Building Standards). The standard had a dozen or so categories covering how someone with restricted mobility might approach and access the building, move through it with ease and move between levels if applicable. 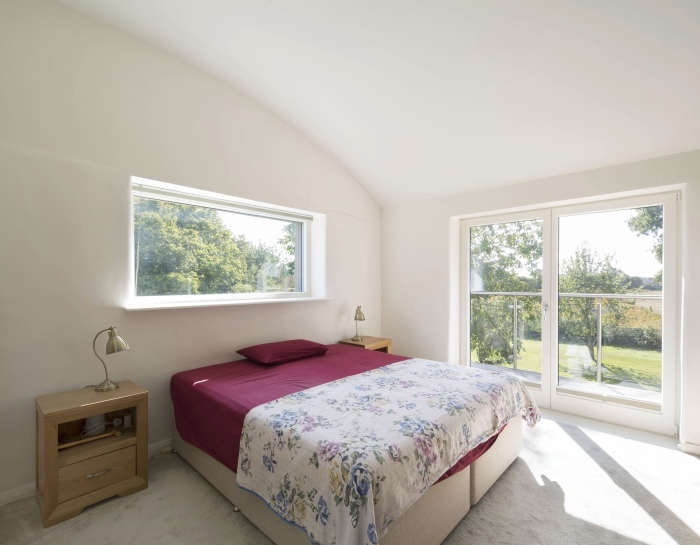 The brief was to provide three main bedrooms, living accommodation, separate kitchen, dining and living room. 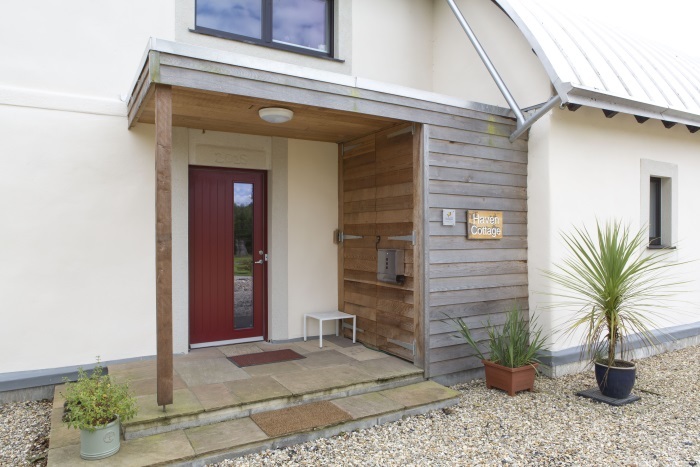 The Lifetime element was incorporated by providing an extra reception room on the ground floor with access to a wet room, which could be a bedroom with en-suite in the future if needed. 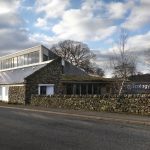 The proposed building had roughly the same floor area as the original planning permission which was a help, and although the finishes were very different, they were judged to be appropriate for being in close proximity of the listed building, and planning permission was granted. 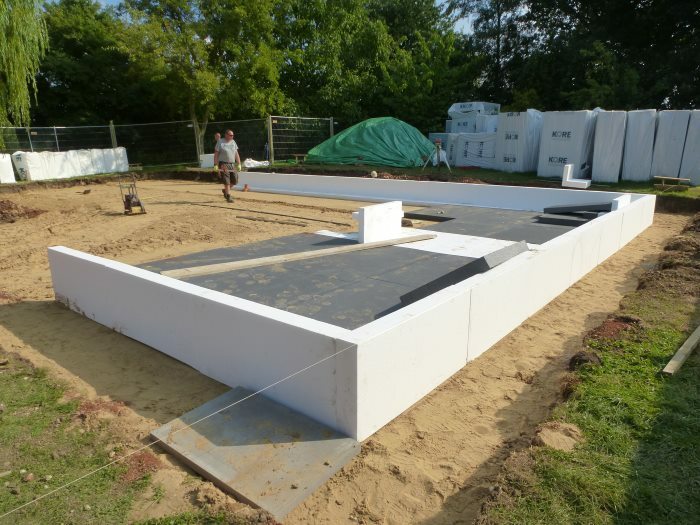 The foundation is an insulated slab system. 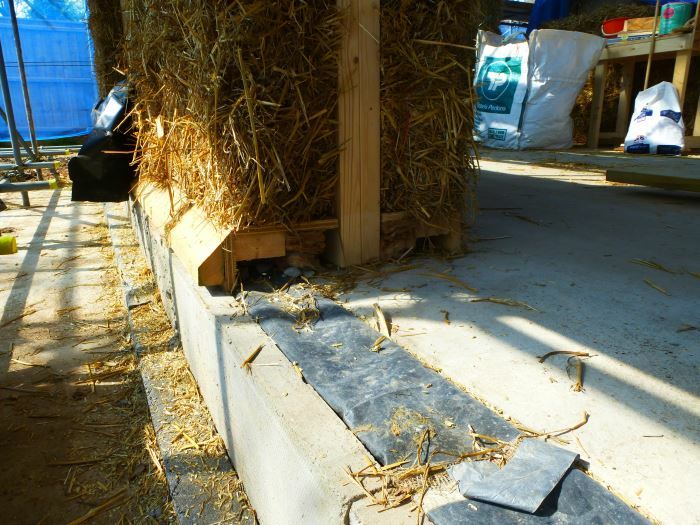 Then there is a taped connection between the slab and the internal wall finish, which crosses over the base plate detail that you need on any straw bale construction. 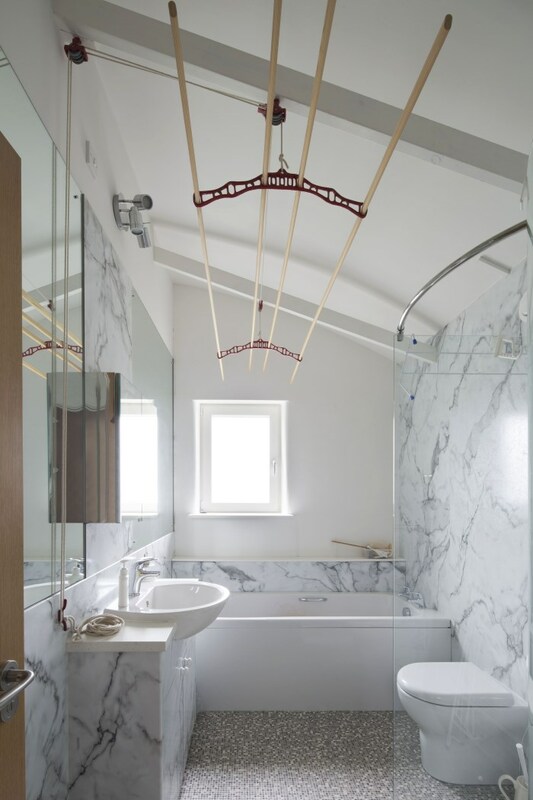 Instead of building first floor joists into the walls, they used a ledger beam approach attached to the box beam, with a membrane between the ledger beam and the box beam that connects the two plaster layers, the ground floor and first floor. 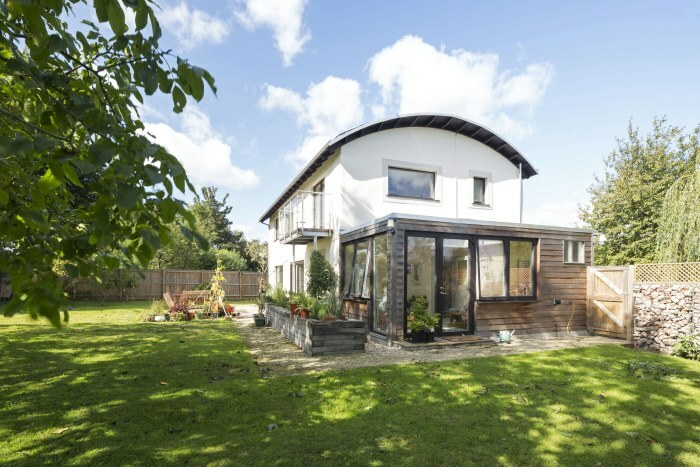 The curved roof uses a standard Intello membrane on the underside of the timber structure, which again is then connected to the render at first floor level. 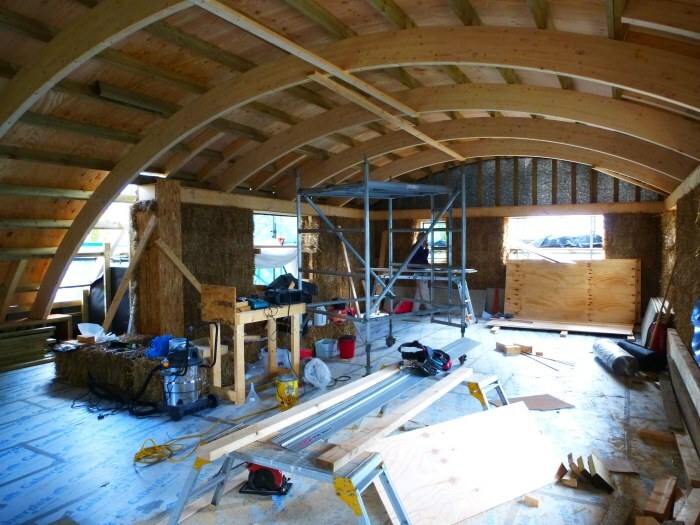 A previous attempt by Fran Bradshaw to build the first load-bearing Passivhaus straw bale house just missed out on achieving the standard. Hers used a structural timber frame, so the bales may not have been as compressed and loaded as those at Haven Cottage. 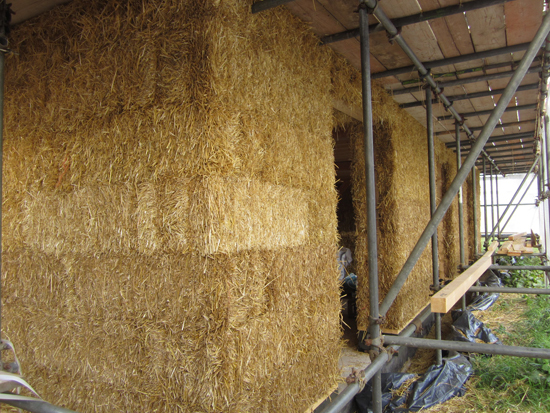 Andrew's assistant was convinced that load-bearing the straw bales would be the best way to go, and by using a wet lime plaster on the inside as the air barrier, it shouldn't be any different than using it on a brick block cavity wall. 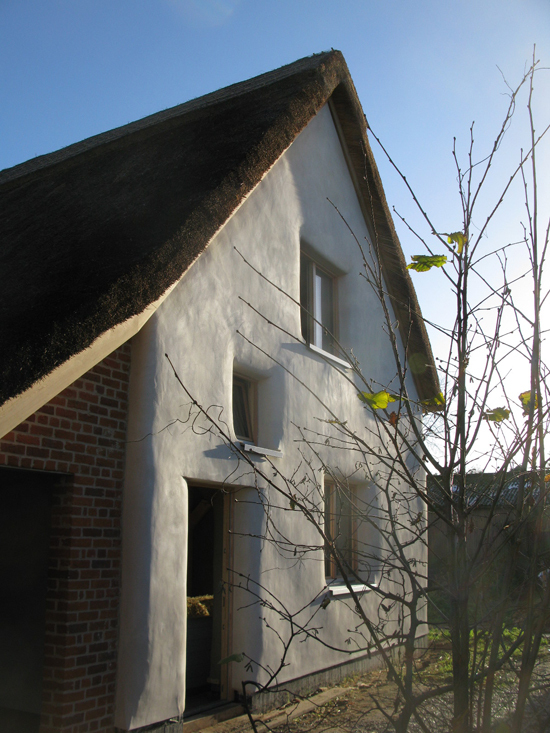 Haven Cottage also has an external lime render. In terms of the construction, part of a ring beam is placed that can be used to compress the bales using wires that run from the base plate up to the top plate, which are then tightened. 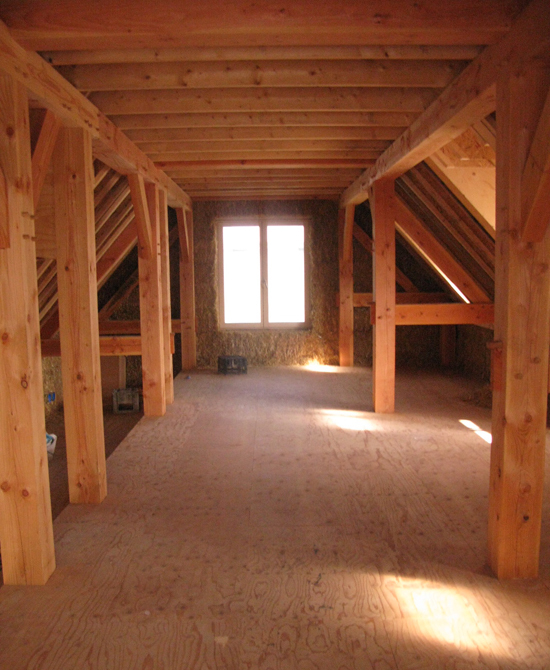 There is a typical compression of around 50mm for each storey height. Once it's compressed it is loaded with the next level of construction up to the underside of the roof. Together with the structural engineer, they worked out a system of curved laminated beams that are actually within the overall depth of the roof. The roof has 40mm of Warmcel insulation. The laminated beams are only 300mm deep. 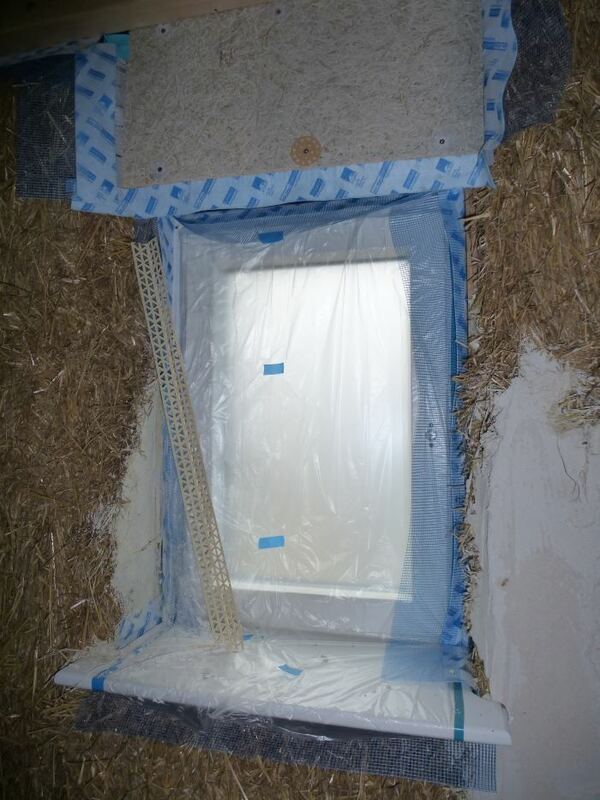 Airtightness tapes were used to connect the windows to the wet plaster reveals, and time will tell whether the added movement that straw bales naturally have will cause cracks in the render and impact on the airtightness. Andrew recommends taking care to look at the building over time, checking the plaster and renders and making sure they are kept in good condition to ensure there is no moisture ingress. Dave was able to take a 12 month sabbatical from work and project manage the construction. He used a specialist substructure and groundworker who did the slab and drains and anything else below the ground. There were a couple of carpenters who worked collaboratively throughout on all of the timber elements. 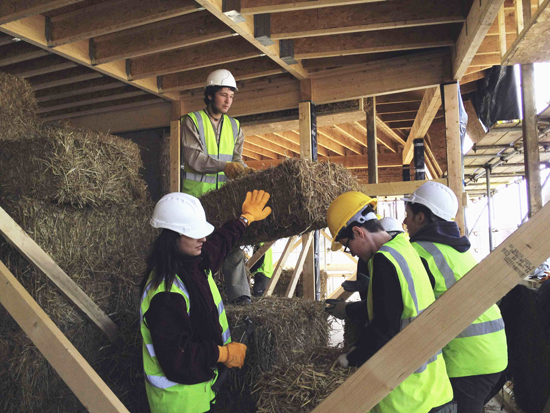 Straw Works provided teams of people to build the walls in their usual method, providing training to people who were interested in learning about the skills of straw bale construction. There was also a specialist roofing contractor. Dave did all the airtightness taping and installation of the MVHR system himself. 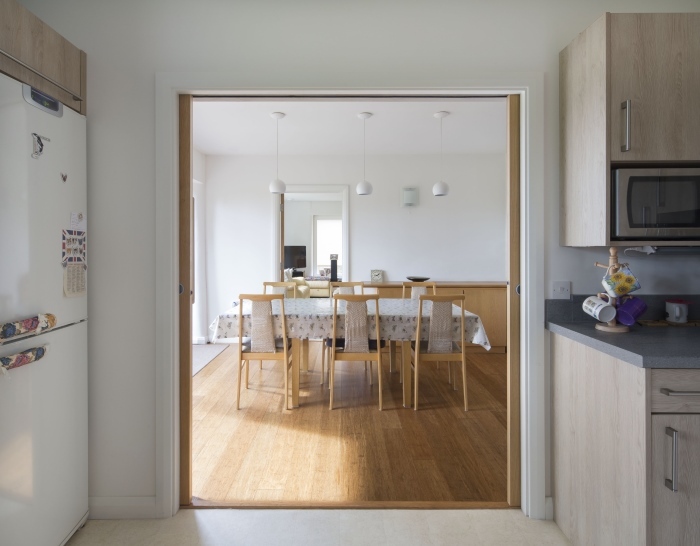 The original design and PHPP model for the building was using a gas-fired boiler for heating, but Dave decided, partly for cost-saving, not to install the gas main. There are three heaters in the house in the hallway and bathrooms, and a post-heater in the MVHR which raises the temperature a little bit above whatever it has come through the heat exchanger with. 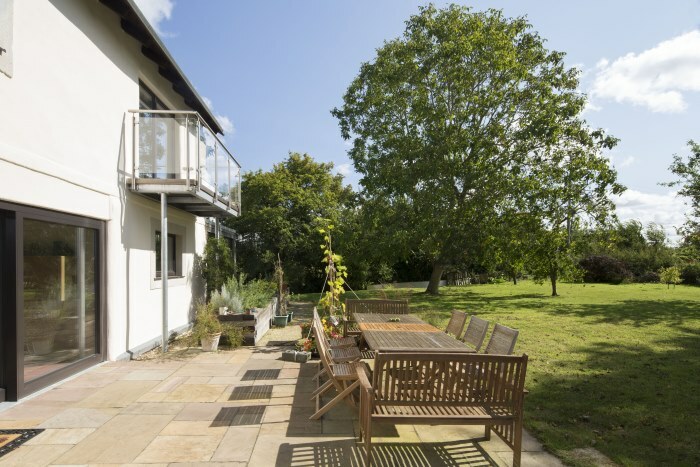 Haven Cottage has solar PVs which provide all the required hot water in the summer, with a bit of Grid electricity needed in the winter to top it up. 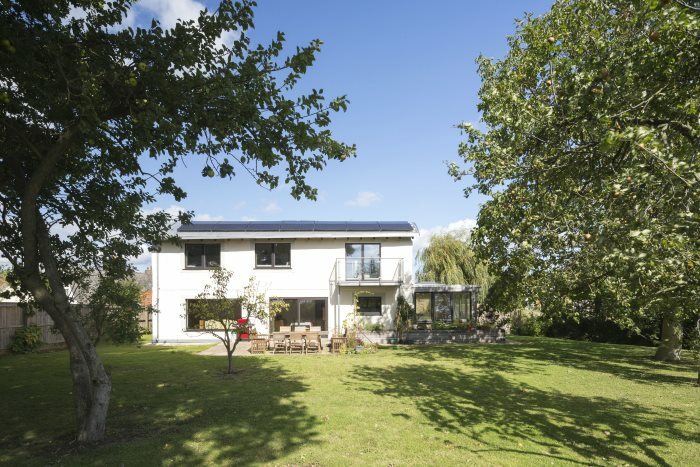 Passivhaus Plus Magazine has calculated that the building is actually making a profit on the electricity side. 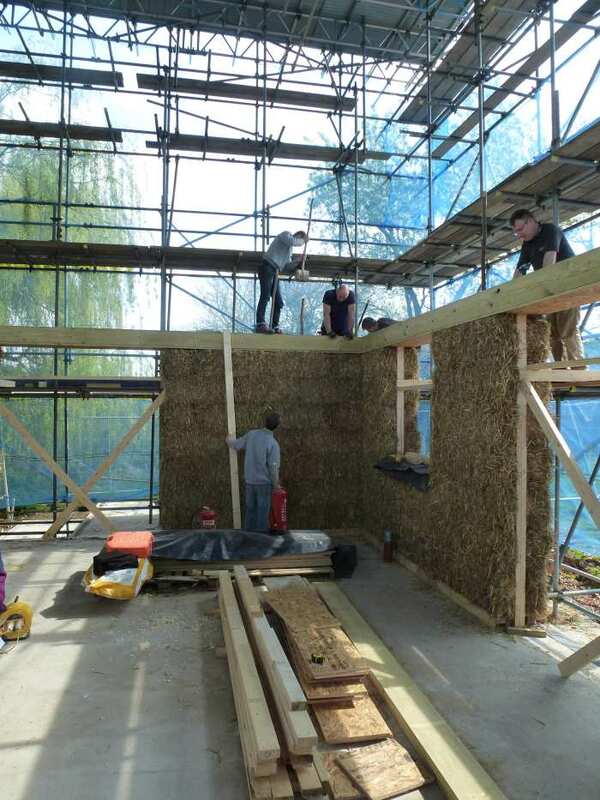 Andrew didn't have any experience of straw bale buildings before coming into this project, but wasn't daunted as he found sufficient information around to understand the normal procedure, and from that work out how to do things slightly differently to meet the needs of achieving the Passivhaus standard. Download a transcript of the interview with Andrew Goodman. 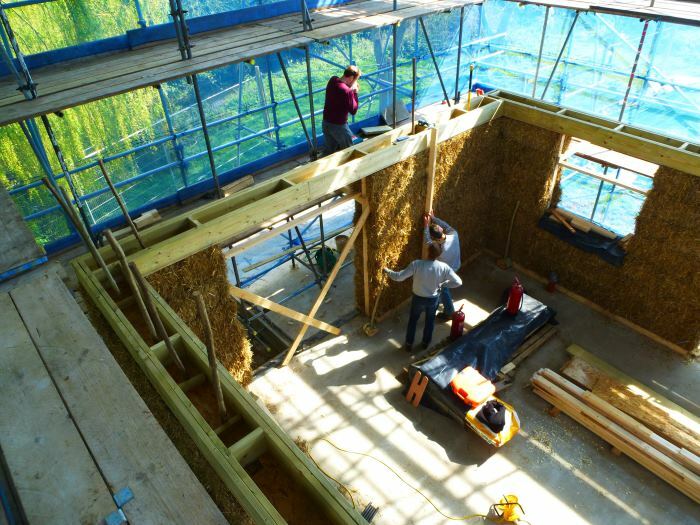 Fran Bradshaw from Anne Thorne Architects shares her experience of building an ultra low energy home using natural materials such as straw bales, lime render and clay plaster. 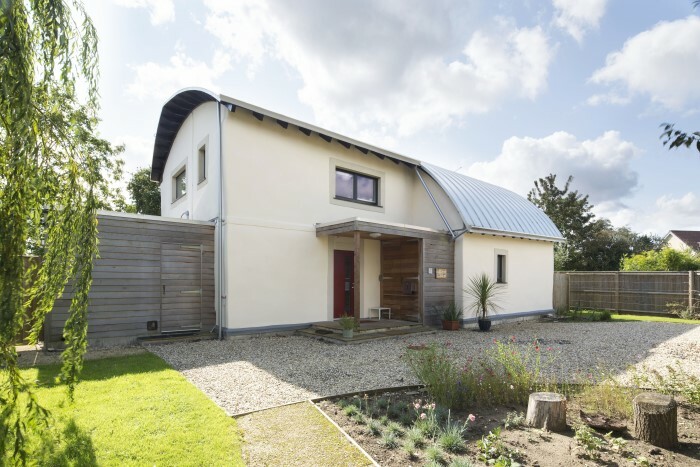 The house is also aiming for the Passivhaus standard. Fran Bradshaw was a builder before she became an architect but she's still very much interested in the practical side of things. A lot of the work she does at Anne Thorne Architects has a focus on sustainability and community-based work. 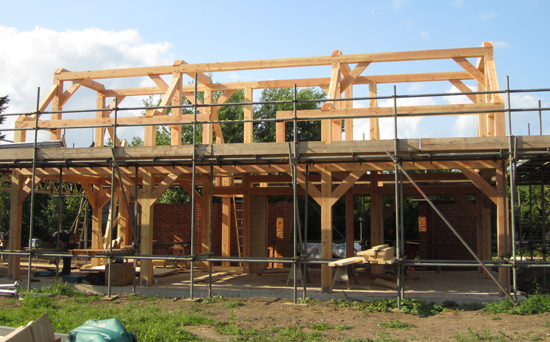 This episode is about a straw bale house that she's building for herself in Norfolk, UK. Fran got inspired to build her own house with straw after working on a project for Haringey Council. 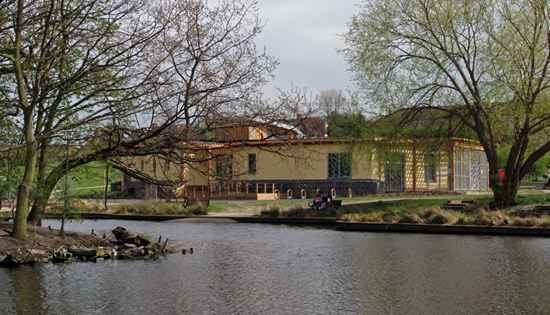 Upon completing the eco-hub, Fran noticed that lots of people commented on the quality of the environment. The acoustics, humidity and the colours are all very different in a building constructed of natural materials – people liked this. 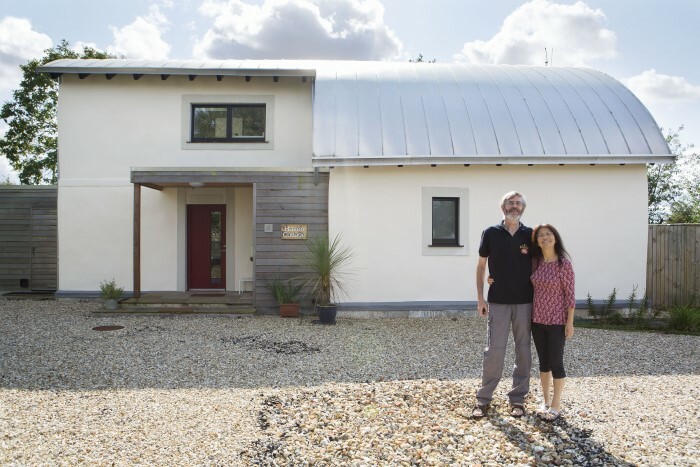 While there have been straw bale houses in mainland Europe that have reached Passivhaus standard, there is yet to be one in the UK. 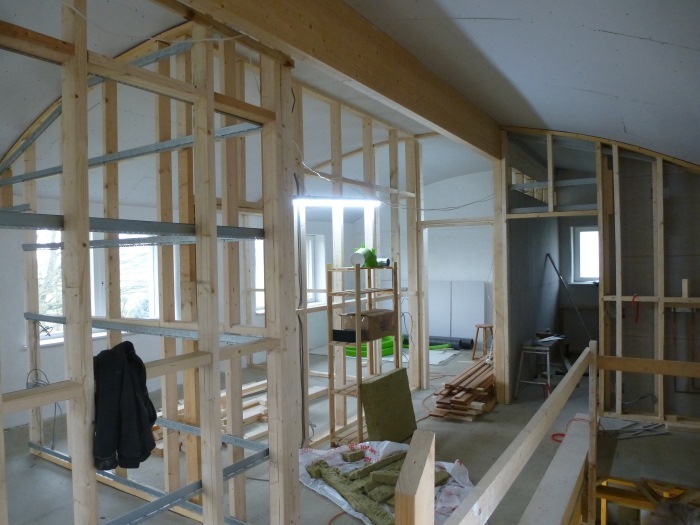 The challenge is in turning what is a rather chaotic building material into something that is actually very precise, because to achieve the Passivhaus standard all the details on all the joints have to be very neat and carefully airtight. 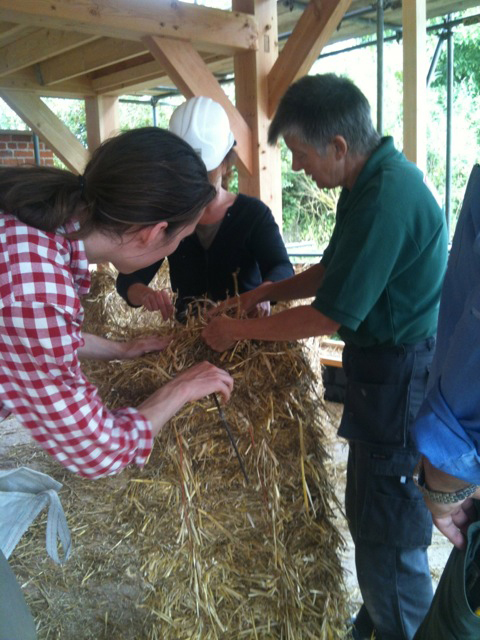 Although one of the reasons Fran chose to build her house with straw was to involve her friends, she leveraged the experience of Straw Works. So guided by one or two experts, the rest of the team members just need to be enthusiastic and prepared to do a little bit of physical work. The site is very close to the Norfolk Broads and Fran discovered that reed thatch was being cut a mile away. In order to thatch well, the reeds need to be the same strength, the same length and have the same diameter. This is partly to do with how well and methodically the reeds are cut, which is why reed cutters are given long contracts to tend a certain patch. The thatch is on fireboard which is moisture permeable but airtight. It's taped at the joints so that the airtight layer is just underneath the thatch. Warmcel – recycled newspaper insulation – then goes in between the plasterboard and the underside of the fireboard. 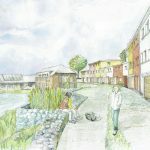 Fran says the connections between the walls and the floor are always tricky to get right and, as this project is aiming for the Passivhaus standard, she opted for a reinforced raft. While there was a level of compromise here it is quite economical on concrete and it gave Fran the opportunity to employ a local contractor (whereas many parts of this build have needed specialists). 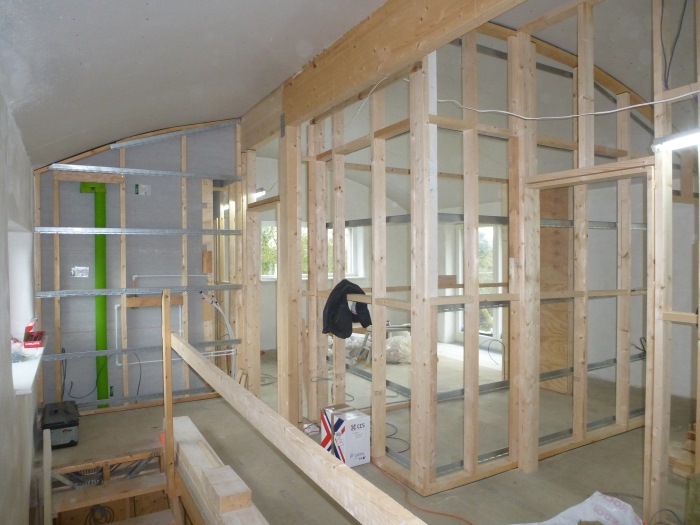 Normally the airtightness layer would be on the inside of the house to avoid warm, moist air from the room going into the wall fabric. As there's timber inside and the straw is outside the timber frame, in this case it would have been very difficult to make the airtight barrier work well (because there are timber penetrations and quite big bits of timber). After discussing the best approach with their airtightness expert Paul Jennings, they decided to use the outside layer of render as the airtight layer. 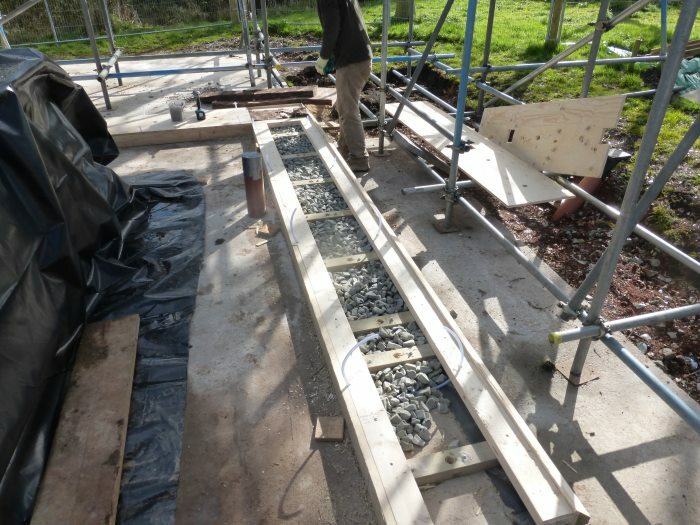 So the concrete slab is the airtight layer in the ground which connects to the lime render on the outside of the straw walls and then to the fireboard on the roof. They are pretty confident this won't be a problem because all the materials are moisture permeable and hygroscopic as well, and the MVHR ventilation will be operating at the coldest times. Moisture monitors will also provide on-going data, so should any issues arise they can be addressed. As the lime render is the airtight layer, any cracks that appear could affect the airtightness and thus the energy efficiency of the house. However, this is just part of using these materials – these cracks will need to be repaired. Fran is expecting this at the end of the drying out process but is not sure how often the maintenance will be after that. There's a Role for an Airtightness Geek! Working with these kind of materials and trying to achieve high levels of airtightness, Fran can definitely see the need for a ‘very precise airtightness geek person' who has a close eye on all the details as the build progresses. This could develop within building firms or be a role that is taken on by a broader group of people. There are certain key moments where you've got to be absolutely spot on, so find out where these are. Planning for those moments and making sure that there are the right people around at the time will stand you in good stead. You Can Always Do Things for Less BUT . . . While Fran knows that there are always ways to cut costs, she derived great pleasure on this project from being able to work with people who she knew were going to do a really lovely job. Although she may have paid a little bit more it's been worth it and she still believes it's been reasonably economical given the materials used. Look carefully at what people have done in the past and trust your judgement about them. For work like this Fran is not in favour of endless competitive tendering. On the whole she's selected people who she enjoys working with and who charge a reasonable rate for what they do. The first air test of Fran's house recorded a figure of 0.9 air changes per hour. 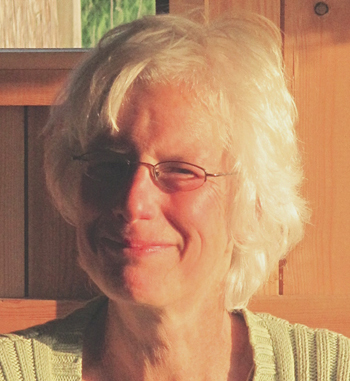 Download a transcript of the interview with Fran Bradshaw. 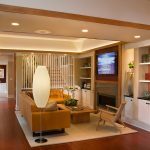 Have you managed to incorporate natural materials in your project? And if not, why? This year we're holding more online debates, which will focus on various aspects of building a house. There's no level of entry! You just have to have opinions and want to get involved.